Click to enlarge. Memorial at Cher (Bourges), September 2015. Both wars are given equal prominence on the face of the memorial but, as is the case everywhere in France, the great majority of the names of the dead come from WW1. For a dramatic illustration of this point, click on the slide of Estaing 1 below. I was in France for September and the research and writing had to be put on hold. But now it is time to return to the blog. One of the first tasks over the next few weeks will be to identify all the men from the Shire of Alberton who enlisted in the first half of 1915. I will provide a detailed analysis of this group, employing the same methodology as for posts 22 and 23 when I looked at the group that enlisted prior to the end of 1914. Then, early in the new year, I will cover all those who enlisted in the second half of 1915; and I will continue to apply this six-monthly analysis through to the end of the War. Additionally, I am going to continue the earlier theme on the more extreme forms of patriotic behaviour that started to manifest themselves in the local community from early 1915. I specifically want to look at the anti-German feelings that arose. This will complement posts 38 and 41. It is also appropriate to analyse the first farewells for men leaving the shire. There were significant differences between the formal farewell staged in Yarram and the more social and inclusive farewells in the various townships. Similarly, it is now relevant to look in detail at the early recruiting committee established in Yarram: its composition, agenda and success. However, more immediately, I want to reflect a little on my month in France. The major activity was a 200K walk in a fairly isolated region in France. It was the ‘Via Podiensis’ or the first 200K of the pilgrimage route of the Camino – ‘le chemin’ in French – from Le Puy en Velay to Conques. It is a stunning walking trail through a part of France that few people see. In fact, probably the only reason any traveller would ever be there would be to walk this particular section of the centuries-old pilgrimage route of St. Jacques, or St. James, which runs all the way to Santiago de Compostella in Spain. It is very rural and the country is rich in both agriculture – the famous green lentils of Le Puy – and dairying. But like so many other rural areas it seems to have experienced significant population movement, as the youth, in particular, have moved to larger cities. It was most noticeable when walking through the small villages or hamlets that there was hardly anyone to be seen. Overall, there were similarities with Gippsland, or at least the part of the Gippsland that was covered in the former Shire of Alberton. One similarity that struck me immediately was that even in the smallest village or hamlet there was a memorial to those who were killed in WW1. As is the case in Australia, these memorials also incorporated names from WW2 – and, additionally for the French, names from the wars in Indochina and Algeria – but by far the greatest number of names recorded the dead from WW1. I have included a gallery of some of the memorials. Most of these towns now have only small populations. One hundred years ago there would have been more people living in them – just like the equivalent places in Gippsland – but most were only ever small towns or villages in an isolated part of France. Yet every one of them has a substantial memorial, with the names of those locals who were killed in WW1. In both Australia and France, people from the local area, however it was defined, felt the powerful need to record the names of their dead. In France, the convention appeared to be that the dead were described as ‘children’ (enfants). Correspondingly, we often referred to our soldiers as boys, but not usually in the formal context of memorials. The presence of all these memorials – not just the ones I saw on the walk but also those in the larger towns and cities I visited, like Toulouse and Bordeaux – also reminded me of the incredible struggle that France faced in WW1. The nation was invaded by Germany in 1914 and the whole of the War, at least on the Western Front, involved French efforts first to withstand and then drive back the invading German army. It was a struggle on a scale never before seen. The numbers are staggering: with conscription, the French forces, including colonial troops, reached 7.5M . The generally recognised figure for combat deaths is in the order of 1.4M and the number of those wounded is commonly given as 4M. The scale of losses from key French battles is as shocking. For example, the largest war cemetery in France is at Notre Dame de Lorette (Ablain-Saint-Nazaire) near Arras. In one year, between October 1914 and October 1915, some 100,00 French troops were killed in the immediate vicinity. Verdun is an even more sobering example. The monumental ossuary there – Douamont – contains the bones of some 130,000 men killed at Verdun between February and December 1916. Over the same period, the total number of French killed was 162,000. The German dead numbered 143,000. What also played on my mind was the question of what the French made of WW1, in this the centenary year. Obviously, like us in Australia, they have had special commemorations. But my concern was not so much the question of the scale of the commemorations but rather their deeper meaning. In Australia, this year’s WW1 commemorations – or, more particularly, the Gallipoli commemorations – have focused on national identity. Gallipoli, according to accepted truth, proved our national identity, defined our core values and even gave ‘birth to the young nation’. So, as a nation, our stake in WW1 has always been, and still remains, fundamentally important and very positive. At the same time, it will be interesting to see, as the next few years unfold, if our commemoration of events on the Western Front will be as significant. What happened to the AIF on the Western Front was far worse than at Gallipoli, but how will we commemorate it? And how will we remember what happened in Australia over the same period? How, for example, will we commemorate the two conscription referenda when the nation voted against the wishes of the government-of-the-day, and when the No vote was represented as a betrayal of the soldiers at the front? Did those votes tell us anything about national character? Or will they pass unremarked? Similarly, will we pay any attention at all to the centenary of the Easter Rebellion in Ireland? I cannot claim to know how the French interpret WW1 one hundred years on, but I can make the case that they do not have such a one-dimensional and simple take on it as we do. For example, in keeping with our historical preoccupation with WW1 as an exercise in nation building and the definition of national character, we make much of the larrikin spirit of the AIF and in particular the reluctance to submit to military discipline and respect the officer class. For the French however there was Verdun, where the slaughter was so great and so unrelenting that the Army mutinied. It is far harder to gloss that particular historical reality into any celebration of national character. Also for the French, the victory in 1918, at such dreadful cost, was followed, not much more than 20 years later, by defeat and occupation. That occupation saw resistance, but also collaboration. 200,000 people were deported from Vichy France. The difficult legacy of those times is still evident in French society and politics today. I was struck, for example, by schools that record – at the very front of the school so that every student sees it – the names of Jewish students deported to death camps. It is a legacy that also touches on questions of national character, but in ways that are more problematic and contested than our simpler, commemorative version of national history. Then there is the obvious truth that Europe 100 years on from WW1 is a very different place. For a start, Germany, even though defeated in 2 world wars and divided for 50 years has clearly emerged as the dominant political and economic powerhouse of Western Europe. You could extend this line of thought and consider how other major powers involved in WW1 now see and commemorate it, for example, Germany and Russia. And if I was walking in Ireland and started to muse on how WW1 and its legacy played out in that particular nation’s history I would find anger, frustration and two markedly different versions of a powerful sense of betrayal. The walk in rural France is over and it is time now to return to the blog on the social history of the impact of WW1 on a particular community in Gippsland. But is is worth keeping in mind that the commemoration of history is never a politically neutral exercise. 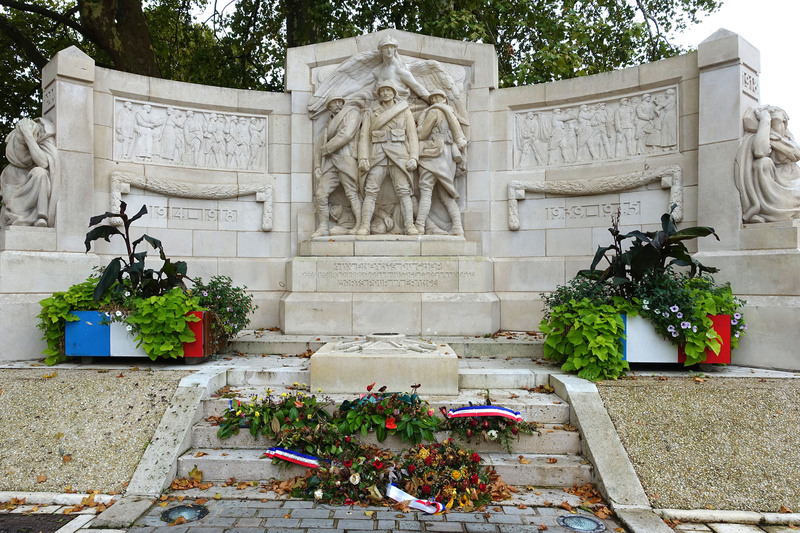 For more background on French commemorations, memorials etc, see Chemins de Memoire There is a (partial) English translation. Crane, D 2014, Empires of the Dead: How one man’s vision led to the creation of WW1’s war graves, William Collins, London. This entry was posted in The politics of commemoration, Updates on October 6, 2015 by pcashen.